For these few weeks I am republishing the "Educating Alex" series I shared in 2009, 2010 and 2011. Since these are direct republishes there may be references to events I wrote about during that time period. There have been challenges and growth since I began this journal, but it may be worthwhile to revisit our educational history. This is the sixth in a ten part series. The following was first published in January 2010. In our previous school district, the Elementary school years were kindergarten through 5th grade. Although this is very common; it meant Alex was in the same academic and social environment for six years; with the same kids and same educators. Most importantly, we had the benefit of similar strategies and philosophies around special needs education. In fact, we moved around the corner when Alex was going into 4th grade. Alex changed schools, but it was still the same model, and her transition was very easy. I believe this consistency in Alex’s earlier education is one of the keys to her success. Alex was eligible for the early childhood program/special education program until she fully transitioned into the elementary school. Our kindergarten was half day; this meant we could send her to kindergarten in the morning, bring her home, feed her and put her on the little yellow bus to go to another school for special services. This model worked well for us, Alex had the socialization and initial academics of a kindergartner in the morning and intense special services in the afternoon. 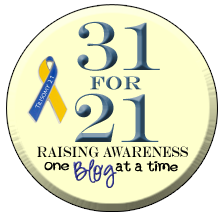 When Alex started first grade I met with her teacher (regular ed) to talk about a success plan for Alex. We had started her at six in kindergarten so she was coming in as a seven year old to first grade. To me, this minimized her delays relative to the other kids. One of my concerns from the beginning has been the other kids; how would they react to Alex, and would she be included in activities. I have always made it my business to meet with the teachers before school started to “brain storm” about tactics around this. The teacher assured me that first graders are still absorbed in themselves and she was not worried about Alex from a social perspective. One of the things I did in first and second grade that worked well was meeting with Alex’s class about a month after school started. As there were actually four classes in each grade, we met with two classes at time. We, meaning Alex and I, she was a much a part of this as I was. Our goal was to talk about Alex, down syndrome and answer questions. 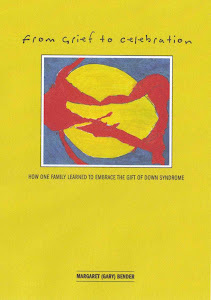 Alex and I started each session by reading a book (link enclosed) Our Brother Has Down's Syndrome by Shelley Cairo. It is the story of a little boy with down syndrome named Jai, as told by his sisters. It is easy to read and teaches the lesson that Jai is just like everyone else. I can practically recite it. Alex and I sat at the front of the classroom, read the book, showed the pictures and stopped for questions along the way. We had practiced little sections for Alex to read, and her classmates knew she was fully vested in our session. We followed this with a questions and answer session. It is fun to think back about those little kids, so excited to know Alex, and meet her mom. First and second graders love to talk, and share about themselves. I would ask them to share what was different about them, and learned interesting family secrets – my lips are sealed. In the end, I believe the kids left with the lesson that Alex was only different because she has down syndrome. She has brown hair and green eyes, she went to the same school as they did, and she loved to play sports. She does have an extra chromosome, and that is what makes her different. The kids loved that chromosome part of the book. Each of these two years I sent a letter home to the parents, explaining the lesson I had taught, and offering myself as a resource. Although I did get verbal comments from the parents, it really was a non-event to everyone involved; Alex was Alex in our community. By the time I had read the book two years in a row every kid in the school had heard the story at least once – mission accomplished. In the beginning of elementary school Alex was pulled out for speech. Socially and academically she was monitored, but as agreed, until she began to have difficulty in the academics, she would stay in the regular ed classroom. We met regularly to discuss Alex’s progress and she began to be pulled out a little more each year. Alex’s delays did not become too obvious until late second grade. I remember our first grade conference when Alex’s teacher reported Alex was one of the best kids in math. I bragged about that for years. Since, she is a math kid, not a reading kid, it was identified early on reading was an area to stress. We asked for and immediately received extra help in reading. As an aside, math has always been Alex’s strength, and until we moved to rural CO, she could add, subtract, multiply and divide up to three digits, and solve simple word problems. Much, much, more about her current education in the next few weeks. I am on a mission! There was a resource room in the school and by fourth grade Alex was in the room about half time. Modifications were made to her curriculum, speech stressed and social skills reinforced, in both the regular ed and resource classrooms. Alex was provided with a one-on-one aide while in the regular ed classroom, mostly to assist with the modified class lessons. In 5th grade Alex was fully prepped to transition to middle school; meetings were held, IEPs implemented and monitored, and transition plans put in place. Sports have always been important to Alex, and these first years were the beginning of building this foundation. Sports; “regular” and “special”, started when she was three. Her favorite regular sport was tee ball/softball. She was coached by the same group of women for a couple of these softball years, and the girls worked well together, and included Alex. There was one modification used in softball, in hindsight I really appreciate the concern shown by all teams involved. In 4th grade, the softball girls graduate from coach pitched to girl pitched. Alex got hit a few times by errand pitches, so after a couple of bruises, it was decided Alex would always be coach pitched. This was great – she almost always got a hit, and the crowds would cheer as she rounded the bases. Alex began karate in 4th grade; this was a great sport for her. She learned balance, strength and to work with her body. I am not sure what belt level she made, but she was on track for her age group. Unfortunately, she lost interest in the 6th grade – I wish now I had insisted. Alex’s special sports were ice skating and soccer. She did play on a regular soccer team until a friend started a special needs team and we joined. Alex was the star of this special team. Alex scored so many goals she had to be made goalie, giving the other kids the opportunity to score. Alex was invited to birthday parties, but not sleepovers. I think this had more to do with the parents' concerns than the kids being exclusive. Luckily, Sarah was in our lives, and provided these social interactions for Alex. She took art classes, swim lessons, tennis, CCD classes (for first communion) and most other activities that benefit a young child. This was our idyllic mid-western Mayberry. The community knew and accepted Alex. The school recognized their responsibility as well as pride in educating Alex. It was truly team work. Naive me, I thought this was the way it was supposed to be, and should be for every child with special needs. Thank you for reposting this - my daughter Cate is in 1st grade right now, a gen ed room except for 2 units of small group. It is only the third week of school and the teacher is modifying her work already. I knew it was coming, I know she is smart but it was still hard when I found out that she should handle 10 spelling words but so was only given 5. Then when I found out the goal for the first quarter was to count to 120 by 1s, 100 by 5s and 100 by 100 by 10 - reality set in. Cate is not a math girl but a reading girl and this is going to be tough. But you posts remind me this is marathon not a sprint and we can do it just like Alex did!